Is there more to life than satisfaction? David Cameron has launched a quest to find a measure of well-being that can be used as an indicator of our national performance – and be used as a measure of the success of government policy. Economic growth, it is argued, is too narrow, and we need to think about other indicators. Fair enough. But I would like to add a note of caution about focusing on many of the measures of subjective well-being that are commonly used in household surveys and question whether they really capture what people care about. The following example, which focuses on the relationship between children’s births and their parents’ well-being, helps to illustrate this. A number of household surveys in the UK now include questions intended to capture individuals’ subjective well-being. These will typically ask people how happy they are on a scale of 1 to 10, or how satisfied they are with various aspects of their life and with their life overall. These may be the kind of questions that David Cameron is thinking about including in his measures of well-being. 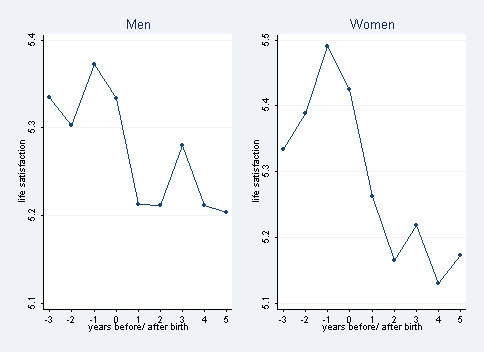 The graphs below plot the relationship between individuals’ reported life satisfaction (on a scale of 1 to 7) over time and the birth of their first child. They are derived from the British Household Panel Survey which follows the same individuals over time – and can measure life satisfaction before and after the big event, which takes place in year 0 in the graphs. What they clearly show is that individuals’ reported life satisfaction falls at birth (after rising during pregnancy) and does not return to its previous level at least for the first five years of the child’s life. Basically, having children makes people “worse off”. This finding is consistent with studies from other countries which find the same thing. Now we all know that young children can be hard work; that their arrival may increase financial worries and place relationships under strain and that people may struggle to balance work and family life. More work is needed to understand why people’s life satisfaction falls when they have children – and to make life easier for new parents where possible. But, another take on this result is that there is more to life than satisfaction. Put another way, people’s reported life satisfaction may have fallen but I doubt that many parents would say that they regretted having children, nor would they think they would be better off if their children were taken away from them. So, one conclusion is that questions about life satisfaction (and happiness) do not capture everything that matters; people care about other things, including their children. Further evidence of this comes from new research findings that people’s choices are not exclusively determined by what maximises their well-being, they also take account of factors such as sense of purpose, control, family relationships and status – suggesting that these too need to be taken into account in developing indicators of the really important things in life. Lags and Leads in Life Satisfaction: A Test of the Baseline Hypothesis”, (Andrew, Clark, Ed Diener, Yannis Georgellis and Rich Lucas, Economic Journal, (June 2008), Vol.118, no.529, pp.F222-F243.